Life is at last returning to normal at our household which is a huge relief. I can't say how grateful I am not to have to make a daily trek to the hospital and eat take out. With that said we have a family friend and a family member who are dealing with very dire health issues. 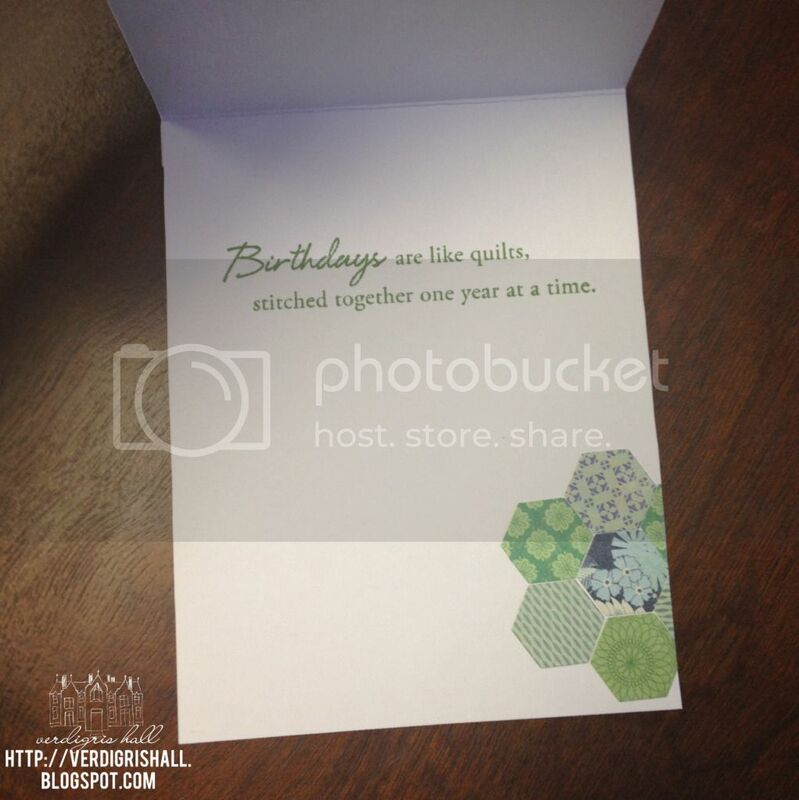 I recently made a couple of cards for quilters for their birthdays. I had been eyeing some stamp sets from Papertrey Ink because my mom loves to sew and occasionally does some quilting as does her friends. I finally bought the Quilter's Sampler and Stitches & Swirls stamp sets. 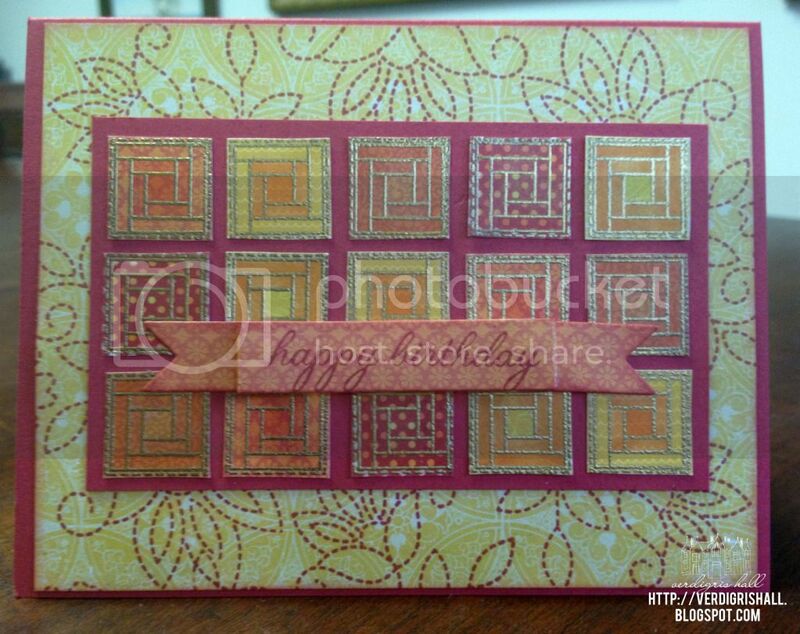 The first card up is all about warm fall colors and using the log cabin square from Quilter's Sampler. I have been on a gold embossing powder kick lately so I embossed several squares on different pieces of patterned paper then I colored them in with Copic markers for more of variation in color. All of this is mounted on red cardstock and then mounted on a piece of yellow patterned paper stamped with Stitches & Swirls in red ink and finally attached to a red card base. The banner is made from a Papertrey Ink die cut from patterned paper. 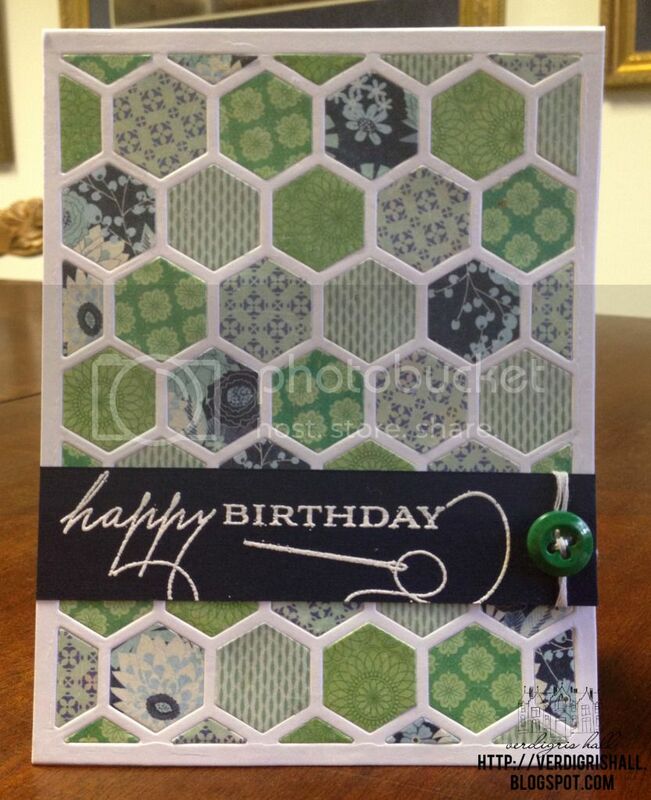 This second card is all about the hexagon die from Papertrey Ink. I remember my great grandmother made my aunt a quilt in a hexagon pattern...perhaps that is the genesis of my hexagon love? Whatever the reason, hexagons are definitely found in quilting and I like them so I was bent on using this new die with blue and green patterned papers. The sentiment and the threaded needle image are embossed in white. The button is wrapped around the navy strip several times. Patterned Paper: Random 6x6 paper pad, Crate Paper; Farmhouse 6x6 paper pad, Crate Paper; Little Bo Peep 6x6 paper pad, Crate Paper; Autumn Press 6x6 paper pad, Studio Calico; Stampin' Up! 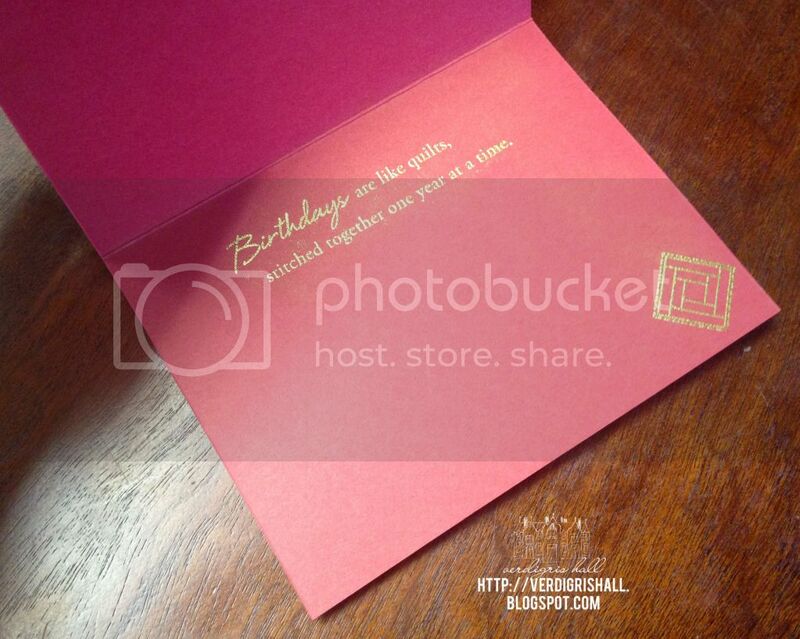 Shay, I love these cards, they are gorgeous! Quilting is in my family, too, I just wish I had enough patience to quilt. Your cards are so beautiful, I may have to try some myself. Thanks for sharing.